I get sad about weird things. The other day, I got sad thinking about sending in the book I'm writing to the editor in a few months. I love writing so much and I've always wanted to write books, so as ungrateful and impossible as this sounds, the truth is, sometimes I have a hard time enjoying good things while I'm experiencing them. Sometimes I have a hard time appreciating a sweet thing while I have it. I get sad too soon about it being gone someday. I'm looking ahead to the time when it ends and I worry prematurely. Sometimes I get sad on vacation, because it immediately feels temporary. Sometimes I cry before I can even see the bottom of the queso cup, because I know it is coming. Sometimes I'll tickle and kiss my babies and instead of savoring the moment, I fear the future. Even if there's the hope of more sweet/fun/fulfilling things coming behind the ones I have now, my heart is wired to know that everything ends, everything dies, and everything sweet will fade. Even good things. Even children and cheese and books about Jesus. C.S. Lewis famously said, "If we find ourselves with a desire that nothing in this world can satisfy, the most probable explanation is that we were made for another world." 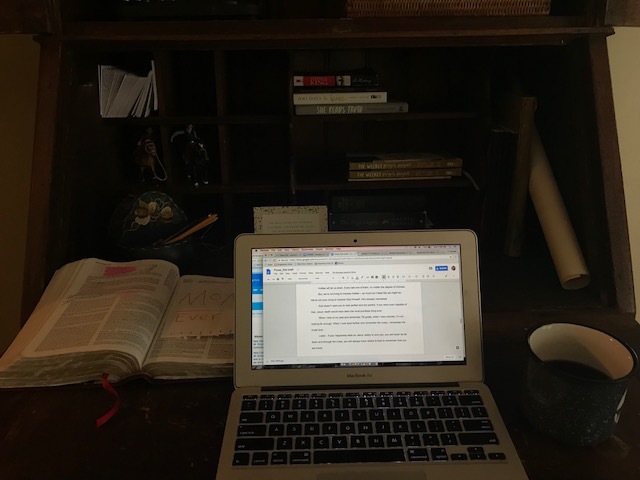 The funny thing is, the books I'm writing are centered around that hope, that truth, and yet, I still find a way to grapple with discontentment. Thankfully, God's Word is always grappling with me. It pushes back against the sadness with deeper things. God's Word is so important. It's important for the seven-year-old who just learned how to sound out words and the busy, working student who babysits on the weekend and the mom with so many kids and the business leader rushing from meeting to meeting and the writer who is doing what she loves and trying to point people to the Light of the world in the process. See, all I have to do is look away from God's words and God's work to my words and my work and things start to feel frighteningly finite. And I can get sad about happy things. But, God's Word brings me back every day. Every time I look at it. Speak it to myself. Write it down. Whisper it in a prayer. God's Word teaches me. It rebukes me. It corrects me. It trains me in righteousness. It does all the things that 2 Timothy 3:16 tells me it will do. It reminds me there is joy after sadness and there is beauty beyond the beauty. I remember that sharing stories of Jesus changing my life will help people experience contentment in Him. I remember that kissing my babies is a foretaste of heaven, when we will be whole and healthy and completely satisfied in Him. I remember that Blue Coast Burrito is open until nine. I remember that looking to the future isn't hopeless if I look past death and keep looking. Guys, this all ends really great for us. No matter how many kisses I get to give and receive and how many books I get to write, when this is all over, we have Jesus. We concur with Clive Staples. We were made for another world.